March 1999: A giant of a horse, in statue and character, a true mate whom I will miss as long as I will live. Which Stallion Should I Use? Hanoverian Verband deputy breeding director Dr Ludwig Christmann takes a look at the stallions on offer, and comes up with the radical suggestion that perhaps we should be looking to certain jumping horses to breed top dressage performers! 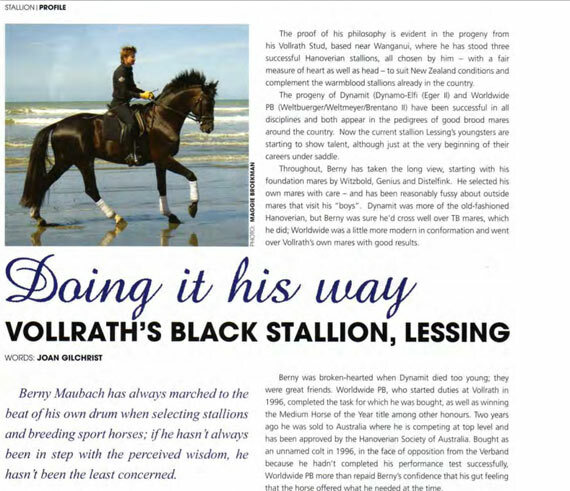 Berny Maubach has always marched to the beat of his own drum when selecting stallions and breeding sport horses; if he hasn’t always been in step with the perceived wisdom, he hasn’t been the least concerned. An article on Vollrath Stud featured in the October 2008 issue of Breeding News.